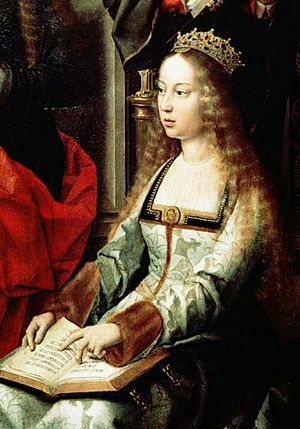 Ferdinand and Isabella were the king and queen of Spain in the late fifteenth century A.D. They ruled over Castile and Aragon which later became the Kingdom of Spain. They were patrons of Christopher Columbus. They established the Spanish Inquisition in 1478 and expelled the Jews and Muslims from Spain in 1492, thus denying the kingdom a commercial middle-class capable of controlling the wealth that would pour in from the Americas during the next three centuries. Their empire was inherited by their grandson, Holy Roman Emperor Charles V, who united the Spanish Empire with the Burgundian Inheritance and the Habsburg lands in Austria and The Netherlands. Colón ante los Reyes Católicos by Juan Cordero. This page was last modified on 9 August 2017, at 11:36. This page has been accessed 9,966 times.